Renault at the 2015 Frankfurt Motor Show, splattered a serene blend of light over the retro cars with its modern looking Renault Coupe C Concept 2015. The model is basically a mirror image to the modernist designing approach during 50’s and 60’s. The major influence behind crafting the concept is said to be the man ‘Le Corbusier’, a legendary designer who went incognito after his tremendous designs. Let us have a look at the review of Renault Coupe C Concept 2015 to know in detail about the retro tribute. The interior of Renault Coupe C Concept 2015 as of now is more into speculations as company didn’t share any information about it. However looking from outside the interior seems to be illuminated in purple light and one can also notice a pair of large transparent screens; one mounted in front f each of the front seats. I presume this could be a head-up display for the infotainment and entertainment coming out from a sci-fi movie. This further clarifies that the concept will only be a two-seater edition. This further throws light over the era of 30’s when two-seater models were very famous. Looking at the model it is also presumed that the interior will bring lots of space for cargo as well. Thus rounding up the interior details of Renault Coupe C Concept 2015 as of now this is all that we have, to talk about. 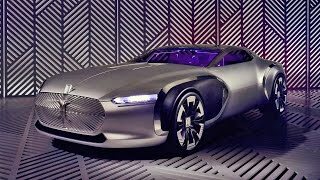 The first glance of the exterior of Renault Coupe C Concept 2015 will look modern to you but a closer analysis will reveal several features borrowed from 30’s. There is a long hood crafted at the front end of the model while at the nose of it is a massive art deco grille. The design language of the model is very much like the man this model pays to tribute to; an amalgamation of Swiss and French work, just like he used to. 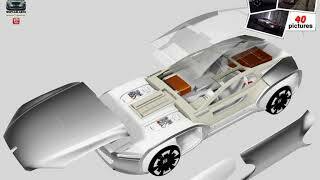 The car portrays a massive appearance with its body and has a pair of giant butterfly doors. In all the exterior details of Renault Coupe C Concept 2015 is a commendable work paying tribute impeccably to the golden era and today’s time. Just like the interior, power beneath the hood of Renault Coupe C Concept 2015 isn’t shared yet but looking at the model we can expect a V12 engine. Same goes with performance figures of Renault Coupe C Concept 2015 and as of now we are speechless about its details.